Welcome to Our Nursery! We would like to welcome you to our nursery and hope that you and your child will have an enjoyable time here with us. It is understandable that entrusting your child into the care of others is probably the most difficult decision that you will ever have to make. At Nazareth House Day Nursery we aim to ensure that your child is happy, safe and cared for in a home from home environment. We are committed to providing a safe and caring environment for children, which encourages and develops their confidence and self esteem and helps them appreciate and value each other. We listen to the needs of our children, parents and staff. We have an open door policy, for parents to come and talk to us as we pride ourselves on being an approachable and friendly team. We welcome and take on board suggestions from parents and carers in order to provide a quality provision for your child. 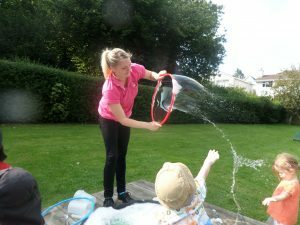 Nazareth House Day Nursery is a private day nursery which is set in substantial and attractive grounds of Nazareth House. We make full use of the space for recognising the beauty of nature and wildlife. We take advantage of our setting to extend planned and free play activities outdoors. The Nursery has two large soft play areas one for Under 2’s which has recently had a new canopy constructed, another for 2 years and over which has a built in covered area, both are suitable for babies and children to play happily and safely. The under 2’s also has their own growing area for flowers, fruits, vegetables and herbs. We also have a large landscaped adventure play area for all ages to use where there are also more areas for growing plants and fruits, vegetables and herbs. 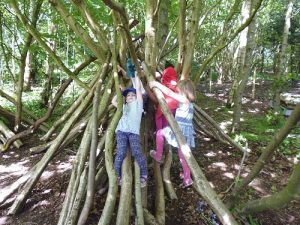 We also have a woodland area we have developed to create a Woodland Nursery using idea’s that are age appropriate from the Forest School theme, which encourages children’s understanding of their natural environment.